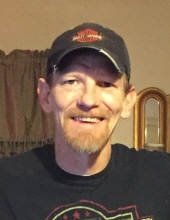 William “Billy” Lee Smith, age 42, died Thursday April 12, 2018 in Lexington, KY he was born in Berea, KY on September 28, 1975 to William Henry and Kathy Fay Roberts Smith. He was a self-employed carpenter, loved to fish, was an excellent wood carver making bird houses and walking canes for friends and family, he also enjoyed gardening. Billy was of the Holiness faith. Other than his parents he survived by his children, William Lee Blake Smith, Brandon Nathaniel Baldwin Smith, and Alissa Brook Smith all of Berea, KY two brothers, Jerald David, and James Marvin Smith both of Berea, KY. One nephew, Jesse James Smith of San Diego, Ca. A host of aunts, uncles, cousins, and friends also survive. Services will be 7:00 PM Monday April 16, 2018 at Davis & Powell Funeral Home with Rev. Bruce Alcorn officiating. Visitation will be 4-7 PM Monday at the funeral home. To send flowers or a remembrance gift to the family of William Lee Smith, please visit our Tribute Store. "Email Address" would like to share the life celebration of William Lee Smith. Click on the "link" to go to share a favorite memory or leave a condolence message for the family.